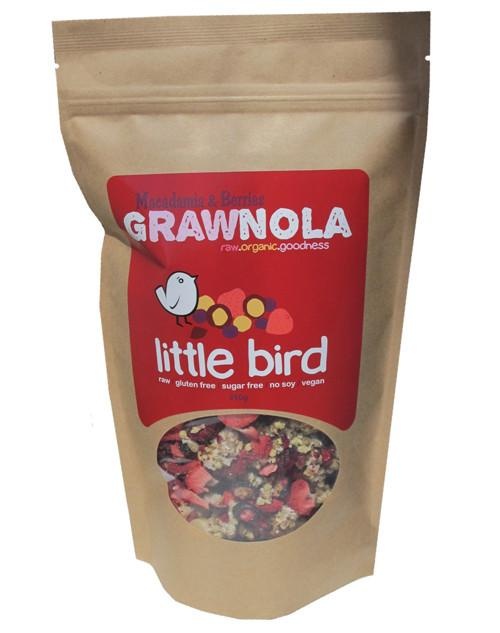 Little Bird Macadamia & Berries Grawnola is the perfect antioxidising start to the day, with superfood fruits like Lucuma, Camu Camu & Blackcurrants - all renowned for being super high in Vitamin C! (Which contributes to cell protection from free radical damage when part of a healthy & varied diet). Our Grawnola is hand-made in small batches. We sprout our buckwheat, sunflower and macadamia, then dehydrate and blend with some of nature’s finest and tastiest antioxidants, including Camu Camu, Blueberries,Strawberries and Currants. This synergistic blend will provide you and your taste buds with raw, nutritional goodness. Grawnola is packed with nutrition so a little goes a long way. Start small - you can always have a second, (or third) bowl. We suggest a serving size of 50g. Best served with your favourite nut milk, or any other that you enjoy. You can also eat it like a trail mix, snack anytime you need a superfood Vitamin C boost. Sprouted Buckwheat*, Coconut Crystals*†, Activated Sunflower Seeds*, Currants*, Macadamia*(8%), Pineapple*, Golden linseed*, Lucuma*, Camu Camu*, Freezedried Berries: (Blueberries* 0.7%, Blackberries* 0.7%, Strawberries* 0.5%, Blackcurrants* 0.5%), Lemon*, Sea Salt*.